I've been doing this silly website for a long time now. It has always been a way for me to catalog all of the records I buy and also stay in the habit of writing about music. Not that I consider myself especially gifted when it comes to writing. My vocabulary may not be the biggest, but I try my best to get the point across. Anything else that's come as a result of this site has been a bonus. The occasion thank you from someone who bought a record because I said I liked it, the dude who sent me a Rocket From The Crypt slipmat for my record player and of course the smattering of free records I'm sent so that I will review them on this site. Sure, some of them have been awful, but quite a few have been pretty darn good and I'm appreciative of them all. Then you have someone like Dan from Young Modern records. He sends me a pretty big pack of some killer records from his label (reviews of those coming over the next few weeks) and on top of that, just to be a swell guy, he sends this Outtacontroller record to me to add to my collection. I'm not sure he even expected me to write about it, but the jokes on you Dan! 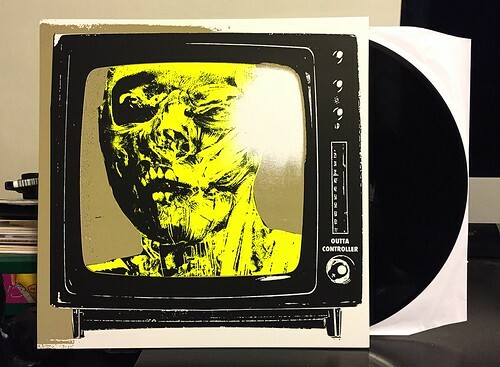 This is a test pressing of last year's phenomenal Television Zombie LP. You can go here to read my full review from last December. In a nutshell, it's a beast of a record full of hooky, fuzzed out pop songs that should appeal to anyone that is into bands like The Marked Men, Steve Adamyk Band, Sonic Avenues or early Something Fierce. Just a great, great album. This version has the alternate P Trash screened artwork. I used to buy a lot of P Trash exclusives, but them being in Germany and the crazy postage increases over the last few years kind of made that a much more limited occurrence. Getting this version is a real treat. On top of that the actual piece of vinyl that is in here is one of the test pressings of the record. I will admit that I'm not really a super big test pressing collector. I mostly just have all of the PopKid ones and a few other random ones here and there, but it was really cool for Dan to send it over as I can't imagine there are more than ten or so of them on the planet. So, this isn't really much of a review, it's mostly just telling you all about a new record I got to add to my collection and the story behind it. Ultimately, that's what I always want this website to be about. The day it turns into a straight ahead review factory is the day I'll lose interest in doing it. Anyway, thanks to Dan for sending this record along. It's a keeper!